The deadline to register to vote in the May election is April 8. Allen County Board of Elections Director Kathy Meyer was the guest speaker at the Lima Rotary Club on Monday. The board is currently preparing for the May 7 election which she says is technically not a "primary" election because there are no candidates on the ballot. Since there are only issues, this is called a special election. Meyer says they can always use precinct workers. There are 38 polling locations scattered around the county and they need to have at least 4 precinct workers at each location. Meyer says the Board of Elections has utilized state grant money to upgrade its voting system. "We have new equipment in place. We have new software, new computers. We also have new tabulators. They're digital versus analog. They will take a digital picture of your ballot. We can pull up the write-ins on the screen instead of having to sort through the ballots. For you as a voter, you're not going to see a whole lot of changes." Also at Monday's meeting, Lesley Fry took the opportunity during fellowship to introduce the new dean and director of The Ohio State University Lima campus, Dr. Timothy Rehner, who was her guest. The Boy Scouts of America is teaching leadership and achievement to both boys and girls. The Boy Scouts of America was founded in 1910 and is one of the largest scouting organizations in the country, serving more than 2.4 million youth from kindergarten to the age of 18. Locally, Scout Executive Marc Krogan told us that the Black Swamp Area Council serves nearly 6,000 youth in 200 packs, troops, crews and posts. Last year the Boy Scouts began including girls in its programming in an effort to meet the needs of today's families. "We found sisters were coming to the pack meetings. They were participating in the activities with their brothers. At the end of the meeting, the boys were coming up and getting the award and their sister was sitting in the back, who just did all the same stuff because we didn't want to exclude anybody but wasn't necessarily getting the recognition because she wasn't a member of the Cut Scout pack." Krogan says that they offer troops for boys, troops for girls, and some troops that are co-ed. They are also partnering with local businesses for workforce development by creating posts in companies like Lima Memorial Health System and Marathon Petroleum to connect youth to adults who can help them explore career options. Krogan says the mission of the Boy Scouts hasn't changed in more than a century: Preparing young people to make moral and ethical choices over their lifetimes by installing the values of the Scout Oath and Law. Also at Rotary, Russ Thomas gave us an update on Family Promise which provides housing and programs for homeless families. He says they have graduated the first family from the home at 730 W. Elm Street. The parents are now employed and have moved into their own home. Family Promise is doing renovations to the house at 1130 W. Market which serves 18-20 year old men. It was damaged by fire in January. And they're evaluating the home at 940 S. Main which needs repairs that may be cost-prohibitive. 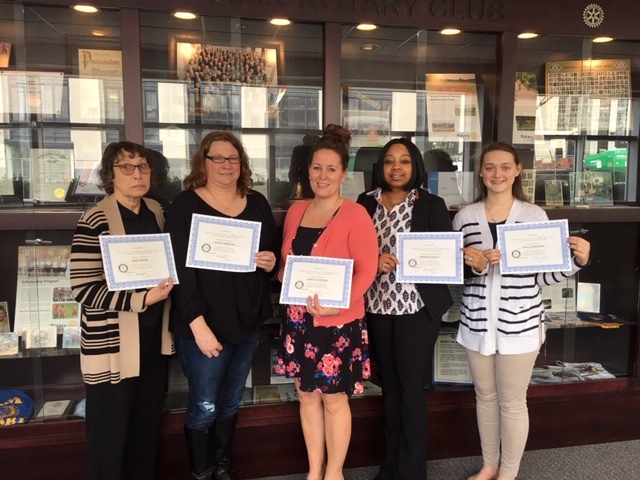 The club also awarded five non-traditional students Lima Rotary Club Certificates acknowledging their scholarship awards for winter 2019 classes. These students are attending Apollo Career Center, The Ohio State University – Lima, Bluffton University and the University of Northwestern Ohio. They are pursuing higher education in Nursing, BS in Health Care Administration, Teaching, and Childhood Development Associate Certification. To-date, the program has awarded 1002 scholarships for a total of $733,250. The Scholarship Committee's biggest fundraiser is the Rex Perry Memorial Golf Outing which is scheduled for June 12. Contact Andy Wannemacher if you'd like to play. Know a Rotarian who is active in scouting? Nominate him or her for the Cliff Dochterman Award. The Cliff Dochterman Award recognizes a Rotarian or Rotaractor who acts as a role model and renders distinguished and dedicated service to scouting. Learn more here. The Lima Rotary Club is accepting nominations for its Avenues of Service awards. the Hulsken Youth Service Award. These past few years, club members have nominated fellow club members for the awards and the Board of Directors has selected the winner in each category. Please send your nominations to Club Secretary Rita Brown at limarotary@gmail.com by Wednesday April 3, 2019. The Board will vote on your nominations and select a winner in each category at the Board Meeting on Tuesday April 9, 2019. 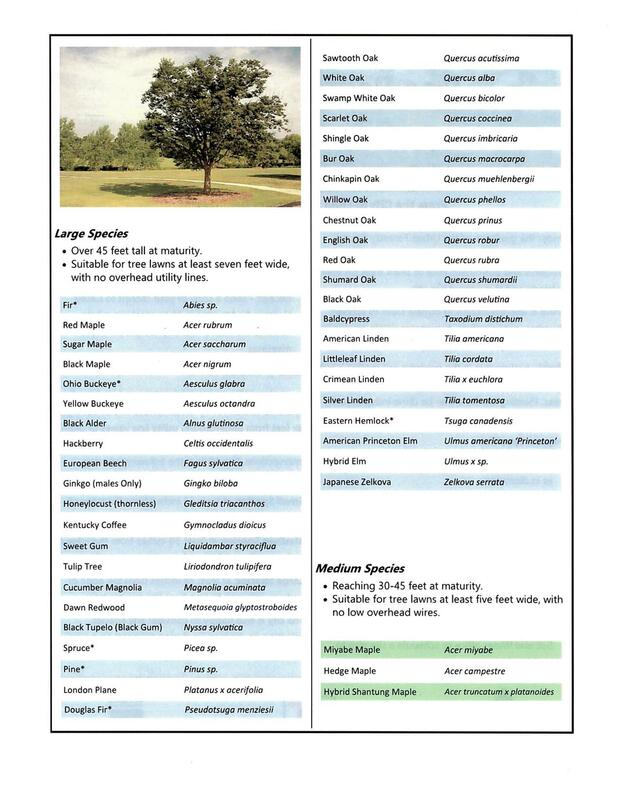 See the criterion for each category of award and the list of past winners by clicking here. 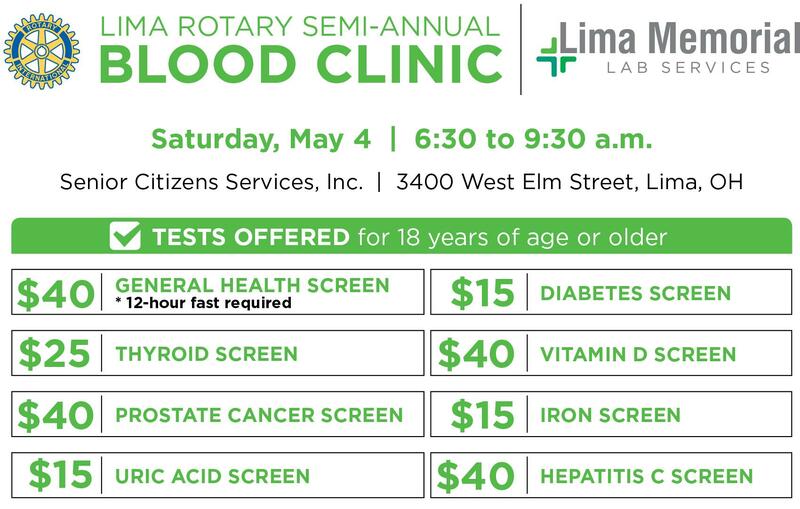 Lima Rotary Club's Spring Blood Clinic is May 4 from 6:30-9:30am at Senior Citizen Services. Our Spring Blood Clinic is a great opportunity for the public to receive low cost blood screenings which are vital to monitoring their health. The registration form can be downloaded here. If you'd like to volunteer, please contact President Paul. 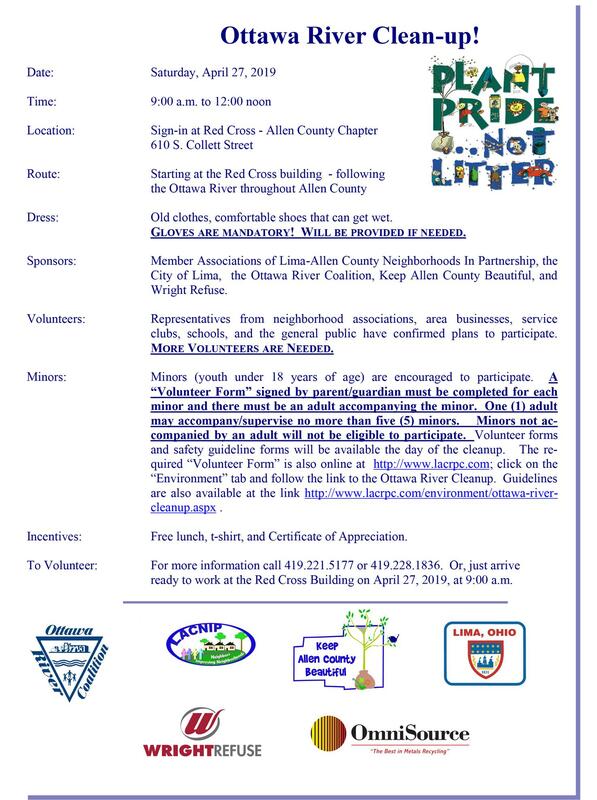 The Lima Rotary Club is putting together a group to help with the Ottawa River Cleanup on Saturday, April 27. 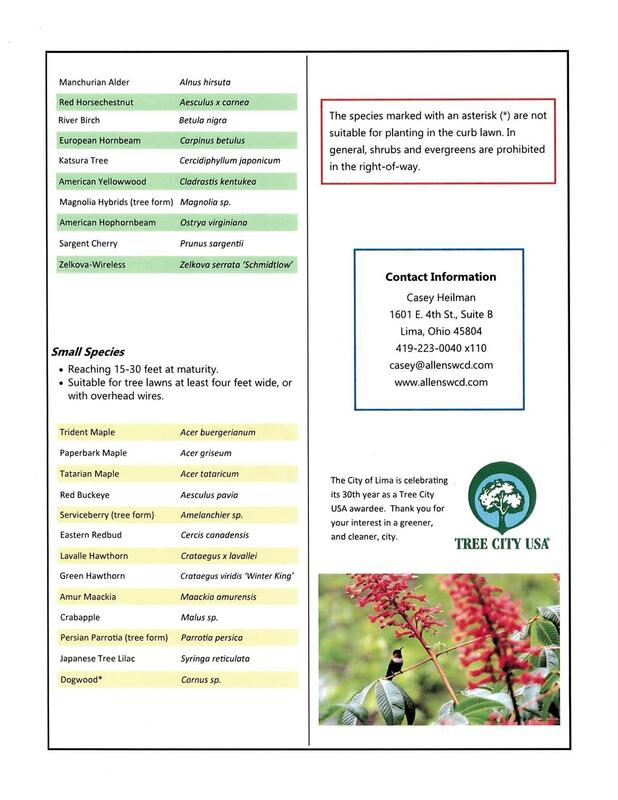 Contact Ben Swartz to join us! 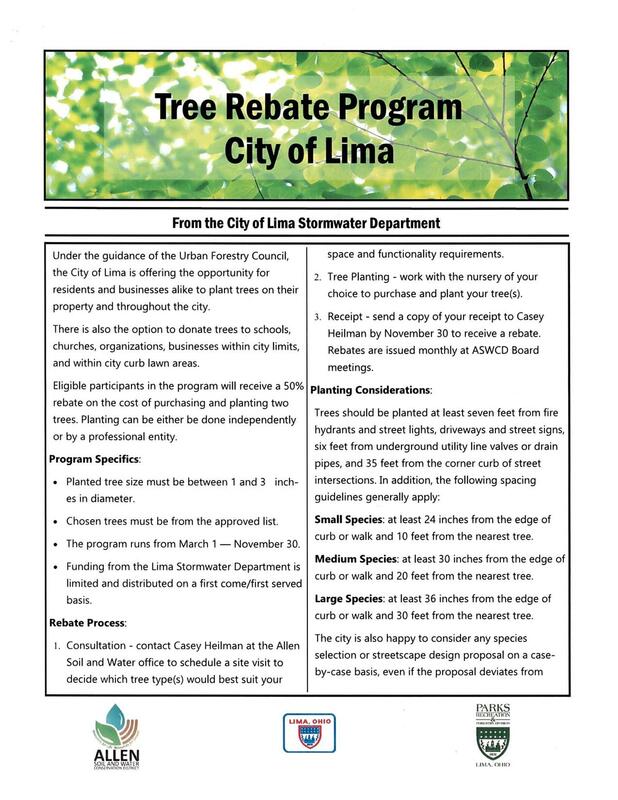 There are rebates available for people and businesses that plant trees inside the city of Lima. The Rotary Foundation has established a disaster response fund to help those affected by disasters around the world. In response to emergency relief, The Rotary Foundation recently established a new support fund to receive contributions for disasters that strike around the world. Entitled the Rotary Disaster Response Fund, staff in Programs and Grants will reach out to the affected areas and their districts to assess the need and desire for funding. 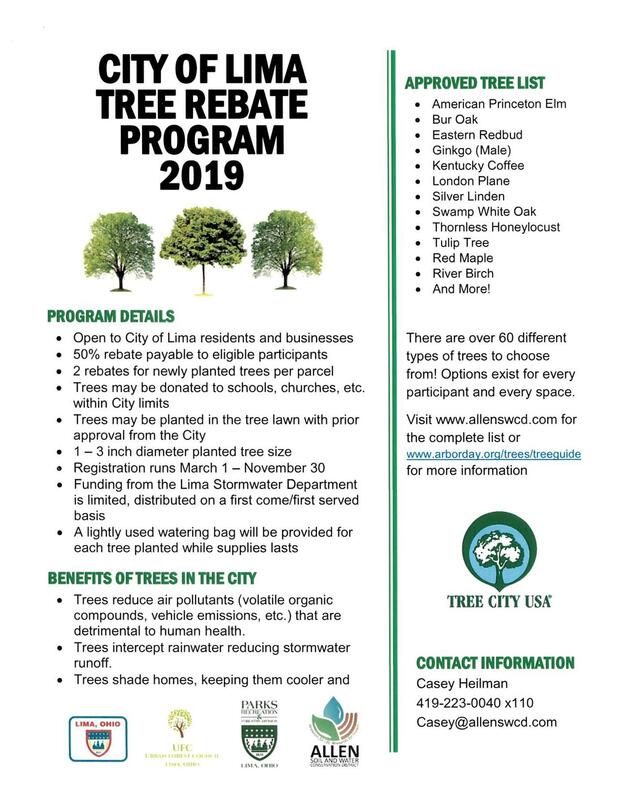 Upon a qualified response - much like a district grant - the affected district will be awarded funding in increments of up to $25,000, consulting the TRF chair as needed. Only districts in the affected country may request a grant. These districts can apply for more than one grant, and should some of the allocation not be used – the funds will be returned to the Disaster Fund. Should requests exceed available funds, the General Secretary of RI will triage requests until additional funds are available.